June 1 marks the beginning of Lesbian, Gay, Bisexual, and Transgender (LGBT) Pride Month, celebrated since 1995 in commemoration of the June 1969 Stonewall riot in Manhattan - a turning point in the struggle for gay rights. Four years before Stonewall, seven women and 33 men picketed in front of Philadelphia's Independence Hall, demanding equality for gays and lesbians on the very spot where Americans first asserted their rights and liberties. From these humble beginnings would emerge the Annual Reminder picket, the first organized, recurring gay-rights demonstration in the country. "There were scarcely 200 of us in the whole United States," recalled Barbara Gittings, a co-organizer of the Annual Reminder. "It was like a club - we all knew each other." Widely considered the mother of the LGBT movement, Gittings (1932-2007) was born in Vienna, Austria. Her family moved to Wilmington when she was a child, and she eventually settled in Philadelphia, where her lifetime of civil rights advocacy began. In 1958, Gittings founded a New York chapter of the Daughters of Bilitis (DOB), considered the first lesbian organization in the United States. She later served as editor of the Ladder, the DOB's national magazine. At a time when homosexuality was included in the Diagnostic and Statistic Manual of Mental Disorders, Gittings fought to have the American Psychiatric Association remove this classification and the "cures" that came with it: institutionalization, electric-shock therapy, and lobotomy. Gittings also sought to end discrimination in the nation's libraries. A nonlibrarian, Gittings served with the Gay Task Force of the American Library Association - the first gay caucus in any professional organization. 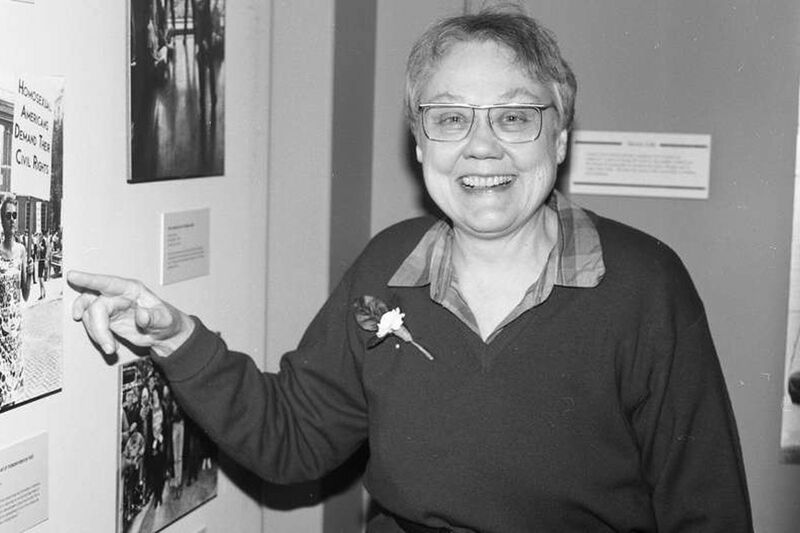 For 16 years, Gittings served as the task force's coordinator, working to create bibliographies of gay and lesbian literature, awards for best LGBT books, and promoting the inclusion of LGBT materials in libraries across the country. Her history, Gays in Library Land, recounts the group's struggles and successes. "I've had the satisfaction of working with other gay people all across the country to get the bigots off our backs, to oil the closet door hinges, to change prejudiced hearts and minds, and to show that gay love is good for us and for the rest of the world too," she said. Philadelphia has not forgotten about her struggle for equality and tolerance. The Historical Society of Pennsylvania is on Barbara Gittings Way, on Locust Street between 12th and 13th, in the heart of Philadelphia's Gayborhood. On Wednesday, HSP will host "Before Stonewall: The Gay Pride Movement," featuring Bob Skiba, archivist at the John J. Wilcox Jr. LGBT Archives; Ada Bello, a founding member of the DOB's Philadelphia chapter; and playwright Ain Gordon.